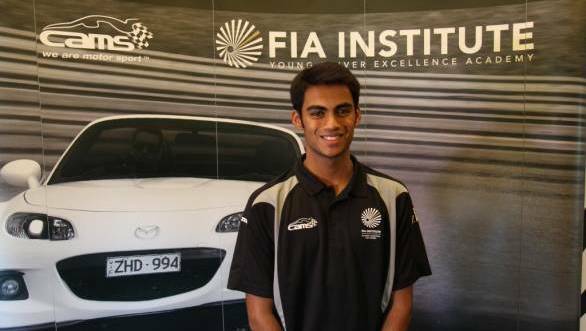 Indian racecar driver, Akhil Rabindra, has won himself a spot in the FIA Institute Young Drivers Excellence Academy. The seventeen-year old Indian driver was put through his paces at the FIA Institute Asia-Pacific Selection Event that was hosted by the Confederation of Australian Motor Sport (CAMS). After a grueling three-day selection process that involved driving, analysis of fitness and understanding of safety and vehicle dynamics, Rabindra earned himself a spot on the Academy's roster. The selection panel comprised three judges - Gus Glover from the FIA Institute, Dr Tony Turner who is an instructor at the Academy, and Lead Driving Instructor Cameron McConville. On the final day of the three-day process, Rabindra was one of three drivers from the original list of 12 drivers from the region. His selection was down to the fact that he beat Petr Borodin from Kazakhstan and Mark Gibson from New Zealand. Rabindra's selection now means that he is part of an elite list of drivers who will gain tremendous experience as a part of the Academy. The other drivers to make it through to the FIA Institute are Venezuelan Diego Ferreira who won the Americas region selection event, South Africa's Kelvin Van der Linde as the winner of the African regional event, Lithuania's Ignas Gelzinis, the winner of the European regional event, and Saudi Arabia's Abdullah Bamogaddam, winner of the Middle East and Mediterranean event. Rabindra's past experience in motorsport includes the JK Racing India Series (Formula BMW) and also the Toyota EMR series. Of course, the driver was thoroughly pleased after he was selected to be part of the academy, stating, "I am honoured to have been selected I would like to thank the FIA Institute, CAMS and my ASN The FMSCI for making this possible. I am looking forward to taking on the other drivers from across the world. The Academy should be great and I hope to lean a lot." Rabindra said. FMSCI President Vicky Chandhok commented, "This is a great initiative by the FIA to develop young drivers across the world. On behalf of the FMSCI, I would like to congratulate Akhil on winning the APAC selection, and wish him all the best in the Academy. There are so many young drivers with so much potential that the future of Indian motorsport looks promising."